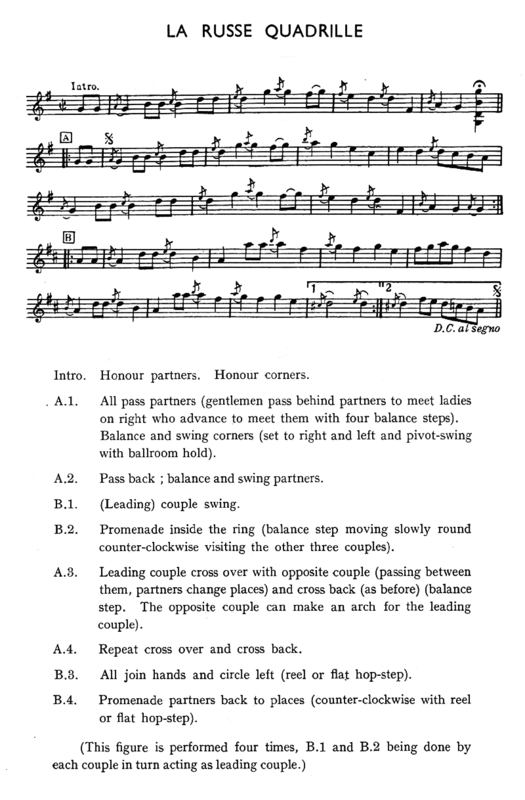 A quadrille living on in the eCeilidh Repertoire; head and side couples crossing back and forth in fast and furious arches. If it's a quadrille, does that mean it's complicated? The answer is, it would not be popular as an eCeilidh dance if it was too tricky. It's quite possible to get it wrong, put it right and it not matter. It was first published around 1847, the arching over and back appearing around 1948. It's a square set of four couples. One will have their backs to the band, they are the "first couple"; there'll be one standing to their right, looking across the set, they are the "second couple"; one standing opposite, facing the "first couple" and the last one facing the "second couple". Giving them labels counting anticlockwise round the set; they are the "first, "second", "third" and "fourth" couple. You'll also hear "Head Couples" when there's a move for the First and Third couple together and "Side Couples" when the caller is talking to the Second and Fourth couple. The scan from John Sweeney's notes on Contrafusion, follow this link to see the history of the dance. Face your partner, but it's not them you are going to be dancing with first. Take a step past them, passing left shoulders, and there'll be someone heading towards you. Kick balance⬀ and swing them. Note that it won't be the first couple doing it every time through the dance, the music will be played 4 or 6 times and it will be different couples taking their turn at doing the "long swing". Stop swinging, it's quite OK to feel a little dizzy and wobbly, it means you've been doing it properly. Step towards the second couple, don't fall over, bow; towards the third couple, bow; toward the fourth couple, bow. The "first" and "third" couples cross over with arches, meaning the "first" lift their arms and the "third" couple duck underneath. The "second" and "fourth" couple wait until there's enough room and then cross over, the "second" couple lifting their arms and the "fourth" ducking under. ... and similarly swap places with their partners. Swap places with your partner and head back the other way in one move? The question is the momentum; how to be in the right place and going the right direction at the end of the cross over, after you have arched over the couple or ducked under them. See the note about the arches further down in the description. Each couple has danced across holding hands, they lift their arm to make an arch. The man steps round into his partner's place (he's turning clockwise, half way round to face the other way). The lady turns anticlockwise under the arch and steps into her partner's place. This is called a California Twirl. The "head couples" cross back with arches, meaning the "third" lift their arms and the "first" couple duck underneath, swapping places with a California Twirl to get back to their original positions. The "side couples" cross back, the "fourth" couple lifting their arms. Circle Left for 16 steps (that is, keep on circling left, don't be tempted to circle left and back). Promenade⬀ back to place. If the man keeps hold of the ladies hand at the end of the promenade, he can help pull her past so they are both heading "their" right directions for the Kick balance. The second time through the dance, the second couple do the long swing. The time after that, the third couple, etc. It can be that the caller tells both the "first" and "third" couples to swing and then the "second" and "fourth". The balances are kick balances, a foot-together jump and a kick, a jump and a kick rather than a "set"
After the long swing the "promenade round the ring" is more of a step to face the next couple and bow. Everybody arches or ducks, head and side couple alternately. The dance appeared in the first book of the Community Dances Manual in 1949, but in a slightly simplified form with no mention of arches. There's some extra subtlety possible with the arching across and back. Consider this is a bit of extra polish, nice if you can do it as it gives a bit is extra fun and swing to the dance, but not anything to worry about. If you are used to turning slightly towards, slightly away, towards and away from your partner when promenading (or arching or ducking) the question is whether you start the move with turning towards each other or turning away. The trick is to work out what you want to be doing at the end of the move, and in general that is to be turning towards each other.